How do you know if you need new roof replacement? Did your neighbor just get a new roof and now your wondering if your home may need a new roof replacement? Select Roofing Consultants can answer all of your roofing questions. There are many factors that determine whether or not your home is in need of a new roof, or just roof repair. If your home has a tarp on it, then you more than likely need a new roof. But if your facing missing roof shingles from last weeks strong winds, then you’re in need of a roof repair. Select Roofing Consultants is your local roofing contractor in Decatur and Atlanta. We provide roof repair, roof installation and roof inspection for both commercial and residential Properties. Contact us today for the Best Roofing Services in Decatur and the Greater Atlanta Area! How to determine if you need roof repair? The first place to look for roof leaks is in the attic. If you can visibly see water stains on the ceiling, you more than likely have a roof leak. Call your local roofing contractor immediately, before your home becomes a breading ground for mold spores. Secondly, you can look for roof leaks by running a hose on the roof. You will be able to find the leak. And then take action. Look at your roof vents. Often time the calking seal could be worn out around the roof vents. DUCT TAPE is not a solution. You need to have the vent seal fixed. Once again you are setting your home up for a major leak disaster. Letting a roof leak go unattended or putting a quick fix on it, can ultimately cost you more in the end. A once simple roof repair could turn into a full on roof replacement, as well as mold issues, and rotting wood. Look for leaks or holes around your chimney. If you see any you must get the flashing replaced. Your local roofing contractor will fix the flashing around your chimney, which will protect your home and chimney from any further damage. 2. 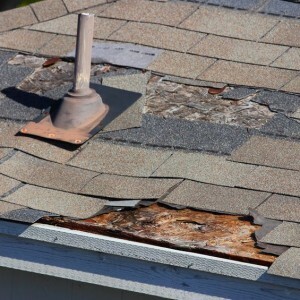 Look for missing shingles: The last storm may have caused your shingles to either be either missing or damaged. Hailstorms are the biggest culprit to damaged roof shingles. Sometimes your roof could look like it got into a fistfight with Manny Pacino. Schedule a roof inspection today. Check out your gutters. Are there pieces of your shingles in the gutters? If you find any kind of shingles or pieces of the shingles like grit, your shingles are facing wear and tear. Roof Age: Most experts believe that a roof should last about 20 years, unless a major storm ripped through. If your roof is older than 20 years chances are you need a new roof. Daylight through the roof: If you are walking on your roof and you notice a spongy feel to the roof, or perhaps a slight bounce to it, your roof has moisture damage. Make sure to check the attic for signs of a leak, contact your Decatur roofing contractor to get the best estimate for your new roof. Buckled Shingles: Do you notice that some of your shingles are curling or buckling? This is typically a sure sign that your shingles are in need of replacement. Getting a new roof may be a hassle, and a huge expense. But a roof is one of the most important parts of the home. Select Roofing Consultants will take the hassle out of your new roof replacement, and get you on the road to having a roof that will look beautiful for years to come. SRC takes pride in the fact that we make the entire process smoother, from filing insurance claims to choosing the best maintenance policy, and we keep you—the client—updated on every step of the project, so you are never out of the loop. In addition to the highly experienced and trained roofing crew, we always send a top-class supervisor, someone who can ensure that the entire project is progressing seamlessly and answer any questions or concerns raised during the replacement. From the first shingle to the last, we are committed to a quality replacement job, making sure that it will be many, many years before a similar project needs to be undertaken. So don’t settle for anything less than the best, and call us today at 404-863-2598.